Editor’s note: Knafel professor of music Thomas Forrest Kelly is widely known for his “First Nights” course on the debut of significant works of music (the course, which concluded with the premiere of a newly commissioned work, was covered in this Harvard Magazine feature . A review of his recent book, on how musical notation evolved, with an embedded video performance and explanation , appears here.) 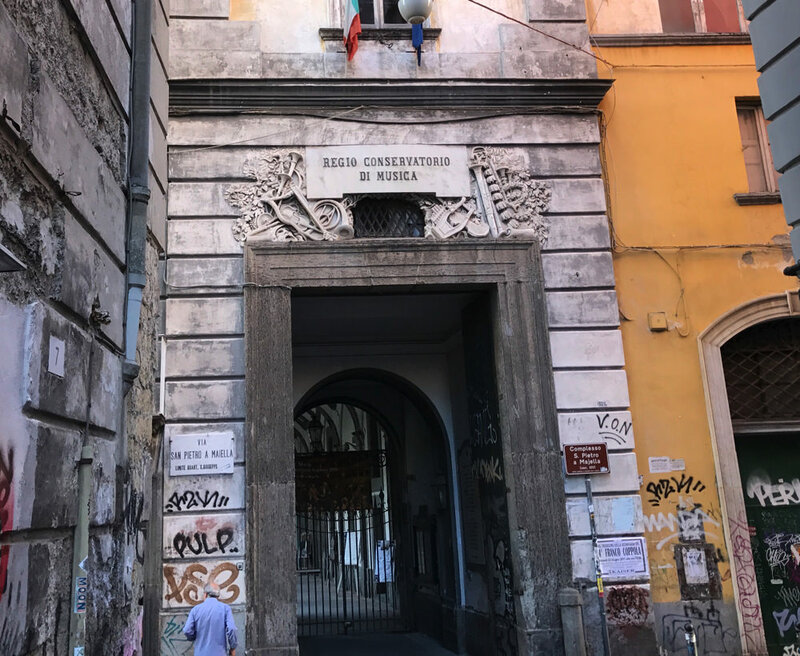 He filed this dispatch from Naples, where he is teaching this summer, and exploring a singularly important musical archive. In addition to his duties as professor and parliamentarian for the Faculty of Arts and Sciences, Kelly is a director of Harvard Magazine Inc. In June, I was delighted to accept an invitation to give a course in Gregorian chant to students at the Naples Conservatory. It’s fun to try to teach in Italian; I get to spend some time in the home of the pizza; but mainly I hope to strengthen a relationship with an exceptionally important institution in the history of music. The Naples Conservatory (officially Conservatorio di Musica “San Pietro a Majella”) is named for the huge convent of the Celestine order, attached to the church of San Pietro a Majella, where it has been housed since 1810. It is like other conservatories in that it trains future musicians in singing, keyboard and orchestral instruments, composition, theory, and history. It is different from other conservatories, in Italy and elsewhere, in the history that lies behind it, and in the amazing contents of its library and archive. But first a word about teaching. Courses seem to be measured in hours, and my course was scheduled for 20 hours. I had already done the first half (!) on a single day in February, so this was to be the concluding 10 hours. But it’s remarkable how the calculation is made. The basic idea is that you do it in a day: from 9 a.m. to 7 p.m., say, is in fact 10 hours. So let’s schedule it for those hours. That includes, of course, the “pausa” in the morning when we all go across the street for coffee, the “pausa” in the afternoon, and the two hours or so at midday when, I guess, it would be unthinkable to teach or learn. Then there’s the fact that my coordinator, and a number of the students, who come from a variety of distant places, are dependent on buses, the Circumvesuviana railway, who knows what, so they can’t really all arrive by 9 a.m., and everybody knows it. So we agree that 10 a.m. or so is a more reasonable starting time. A bit before 10, when I arrive, nobody is there; the portiere at the gate has never heard of me, is reluctant to unlock the room (Aula Gesualdo) in which I’m to teach; finally my student assistant appears, and we are able to scrounge a computer projector (there’s no screen, and the only plug is about 20 feet away, no extension cord) and jury-rig something. So we really start about 10. Toward the end of the day (having resumed at 3 p.m. after a two-hour lunch break), various students begin to apologize that their bus is leaving, their train is leaving, etc. And my assistant “reminds” me that the Conservatory itself closes at 6 p.m. today. So 10:15 to 1 plus 3 p.m. to 5:45 or so, minus two coffee breaks constitutes, officially, 10 hours of instruction. We all sign the sheets attesting to this, and everybody goes away happy. The students were terrific, we sang a lot, they were lively, interested, polite, agreeable, showed me videos of how they think Americans make Neapolitan food, gave long disquisitions on pizza, coffee, politics. I had a wonderful time. How much they learned about Gregorian chant? Not quite 10 hours’ worth, I should think, especially since there seems to be no question of reading or of written work. The various rooms in the library are named for Neapolitan composers and for composers who worked in Naples. The real treasure of the Conservatorio (other than its students, of course) is the library, which houses an astounding collection of musical scores. Combining the libraries of the various constituent conservatories with important donations of the seventeenth, eighteenth, and nineteenth centuries, it has historical materials of a sort not usually found in music schools. And by a fortunate circumstance, the Bourbon kings of Naples decreed that no opera should be performed in any theater in the city without a copy being deposited in the Conservatory library, a decree that was reiterated through the Napoleonic era and down to the unification of Italy. The result is that the library contains thousands of scores of operas: not only those composed in Naples, including many autographs, but everything performed there, from Alessandro Scarlatti down to Giuseppe Verdi. Naples is considered by many to be the place opera really comes from. Yes, it may have been invented in Tuscany; yes, it may have been improved in Venice and Rome; but it is really in Naples that it grew, and it is from the Naples of the seventeenth and eighteenth and early nineteenth centuries that most of the composers and singers, trained at the Conservatory, spread the tradition of Neapolitan opera over all of Europe. It may be that the names of Alessandro Scarlatti, of Paisiello, Traetta, Piccinni, Sacchini, Pergolesi, Jommelli, Porpora, are not household words nowadays. But in the world of opera they are the Neapolitan School, and their works were known everywhere. The Conservatory is full of their scores, along with scores of Bellini, Donizetti, Cimarosa, Mercadante, Verdi, and countless others. There are some 7,000 opera libretti in the collection, and some 600,000 scores, autograph or rare. There’s a collection of some 12,000 letters of composers; a unique collection of nineteenth-century costume designs, and lots more. And there is a marvelous collection of musical instruments, gathered—or rather accumulated—over the years, of significant musical and historical interest. Among them are a piano presented by Catherine the Great of Russia; Stradivari’s only harp; and much else, including Neapolitan mandolins. This double-ended instrument, a harpsichord on this side, a pianoforte on the other, was presented by Emperor Frederick II to King Ferdinand of Naples and his queen, Caroline (the emperor’s sister), to thank them for the musical festivities presented by the Conservatory in 1774. Most conservatory libraries are sources of Beethoven piano sonatas, Schubert songs, parts for string quartets, and the other materials that the students need. This is not that kind of library, even though it also provides those usual resources. And because it is a conservatory and not a university, the Conservatorio depends on the Ministry of Culture, and the resources that a university library might be able to command are not available to the Naples Conservatory. There is only one (part-time) librarian; everybody else is a volunteer. There is no ongoing project of cataloging or digitization, and the state of preservation of the materials is a bit precarious, and access is not easy. It’s hard to blame anybody for this, and the director of the Conservatorio, Professor Elsa Evangelista, is fully aware of the enormous value of the historical materials in her charge. She does what she can, but the resources are never enough. Even so, my colleague Dinko Fabris, a musicologist who teaches music history at the Conservatory, tells me that more than 60 percent of the musical patrimony of Italy digitized in the database of all Italian libraries (www.internetculturale.it)  is material from the library of the Naples Conservatory. For me, part of the pleasure of the Naples Conservatory is the location, the charming people, and the pizza. But it’s also being in the presence of one of the greatest collections of music in the world. I hope that more of the world will come to realize the worth of this great treasure, and figure out a way to preserve it and make it more widely available. Meanwhile, I hope the Neapolitan warmth will stay with me when I return to Cambridge in the fall.